The Illinois House of Representatives on Thursday introduced a resolution to congratulate Winston Mezo, Carbondale’s legendary bagel man, on his “distinguished career” and retirement. The resolution, sponsored by four SIU graduates in the legislature and one local representative, calls Mezo’s retirement a major loss to the region. “Illinois is a better place as a result of his service,” the representatives said in the resolution. 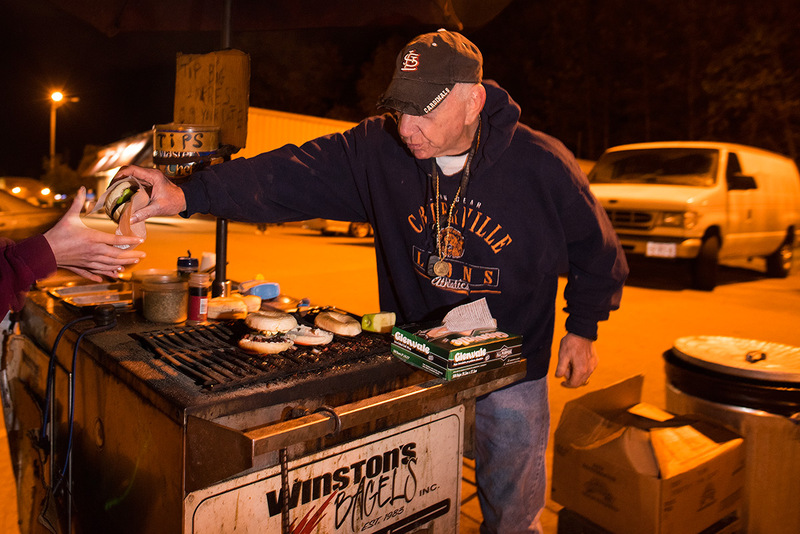 For 34 years, Mezo has stood above a charcoal grill in the parking lot of Pinch Penny Liquors, selling bagels covered in anything from onions, cucumbers and bacon bits to sunflower seeds, raisins, apples and cinnamon to bar-goers until as early as 3 a.m. He then packs up his supplies and heads to Walmart to restock. Mezo, better known as the Bagel Man, has been a local legend since 1983. The 75-year-old man from Herrin took up the business as a distraction from drinking alcohol. He now works with a local 12-Step program, a group that helps members achieve sobriety. Mezo has been sober for 35 years and has been making bagels for just as long. In a recent interview, Mezo said he will terribly miss interacting with SIU students who make their way to his cart. “It is universally agreed that things just will not be the same without Winston Mezo standing behind his cart,” the resolution stated. Weather permitting, Mezo will fire up his grill one last time from 9 p.m. to 3 a.m. Thursday through Saturday in front of the Pinch Penny liquors. Staff writer Luke Nozicka can be reached at 618-536-3325, [email protected]or on Twitter @lukenozicka. Winston has been part of going to SIU for both of my daughters for over 8 years. He is part of the fabric of SIU!!! He will be missed. I wish he was still going to be there part time. GREATEST OF LUCK TO YOU WINSTON!!! I remember him, loved the bagels!! I always thought it was so cool he would be out there selling bagels. His were the best. Thank you Bagel Man. You made a difference in many lives and a smile on many faces. Good Luck in your retirement. My parents met at SIU and one of the stories they would tell us was about “The Bagel Guy.” My dad would even make us Winston inspired bagels for us at home, in Northern Illinois. When my sister’s and I decided to go to SIU, we were so excited to see Winston still out there, and we would visit him on many occasions. My parents loved stopping there when they came to visit. Thanks for your many years! Enjoy retirement! Someone should start a gofund me page to erect a statue of Winston.